Information: Dean and Nancy Linscott, teachers, researchers, organizers, and authors of instructions about folk dance. Dean Linscott, son of long-time folk dance leaders Mark and Wilma Linscott, of Bakersfield, grew up with folk dancing in his blood and gained more as a student at the University of California at Los Angeles (UCLA). He performed with the Gandy Dancers in Los Angeles and became its co-director. He also was a member of the Cygany Dancers (formerly, Dolina Cygany) of San Diego. Dean was married to Nancy. Dean moved to the San Francisco Bay area in the Summer of 1964 to take a position as Professor of Microbiology at the University of California at San Francisco (UCSF) Medical School and searched for a single group in which he could continue dancing and performing Balkan and Central European dances. 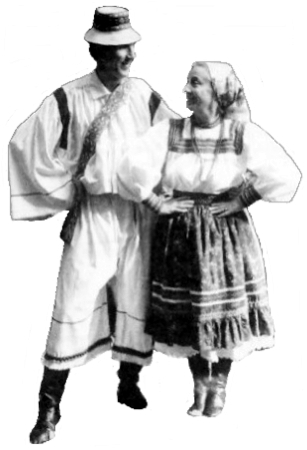 Then came a move to Mill Valley, California, after which he formed and taught a new folk dance group, the Kopachka Dancers, at the Mill Valley Recreation Center with about 30 dancers. Within six months, the group had their first performance under their belts. In 1971, the ensemble gave their first full-length concert to a sell-out crowd of more than a thousand people. The Kopachka Band, not content to only play for performances and Kopachka parties, also branched out to playing for other dance functions around San Francisco. After attending Madelynne Green's Mendocino Folklore Camp in 1966, Dean started a family dance camp in Sonoma's Valley of the Moon, inviting ethnic and master instructors to teach. Over the years, the list of teachers included Gene Ciejka, Bora Gajicki, Barry Glass, Madelynne Greene, Johnny Pappas, Jan Sejda, Nena Šokčić, and C. Stewart Smith. A main thrust of the camp was to teach the song words to the dances being taught and to have folklore sessions. He and Nancy were also directors of the Mendocino Folklore Camp for 17 years. Dean continued to be involved in running folk dance classes for families, young people, and even one for men only. He taught at folk dance camps and the California Statewide Festival, where the Kopachka Dancers performed. Nancy was active with the Scandia Camp of Mendocino, California. Dean passed away March 24, 2004, leaving a huge gap in the folk dance world. Balkan dancing and 'kolo' etiquette, by Linscott, Dean, in Let's Dance!, Aug-Sep. 1971, p.5-8. North-South Folkdance Teachers' Seminar (syllabus), 1974-. Dances documented by Dean Linscott, a collection of which Dean sent to the Society of Folk Dance Historians on February 16, 1999.